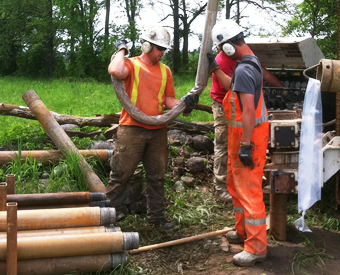 Underground Sonic Drilling Services Inc. provides remote drilling services in central and Eastern Canada where large diameter continuous core samples in rock and overburden are required. 3″ to 7″ diameter soil cores. Recovery of unconsolidated material to depths 90+ meters. Quick change-over to conventional H or N size rock cores. Underground Sonic Drilling Services Inc. operates full sized 6×6 truck mounted and track mounted rigs. Combined with 4×4 service trucks, ATV’s, track loaders and track water haulers we arrive fully equipped to accommodate your site topography and job scope. Our high frequency sonic drill vibrations allow us to quickly advance our soil core-barrels through challenging strata without the use of fluids. This dry advancement prevents fine and soft zones from washing away – giving you a highly representative core sample. Underground Sonic Drilling Services Inc. offers sonic cores ranging in size between 3″ and 7″ in diameter. If bedrock confirmation is required or the scope is to advance into bedrock we can quickly change over down-hole tubing to conventional diamond drilling systems. We operate PH or N size core barrels with air or water flushing mediums.